STOP EVERYTHING AND MAKE THIS IMMEDIATELY! 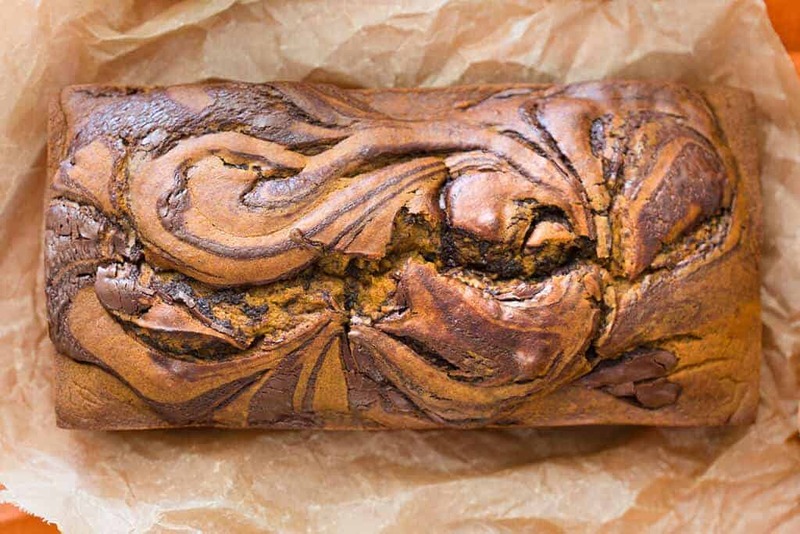 This pumpkin bread swirled with chocolate is so good that I ate it all. I hid it from my husband and had a some for breakfast, after lunch and for a late night snack until it was all gone. 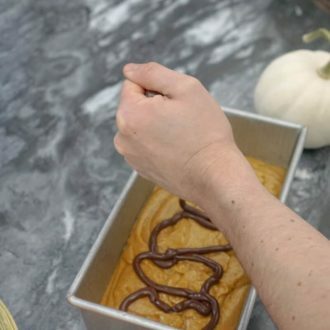 It is pillowy soft and the chocolate mixed with the pumpkin and spices make for the perfect bite! 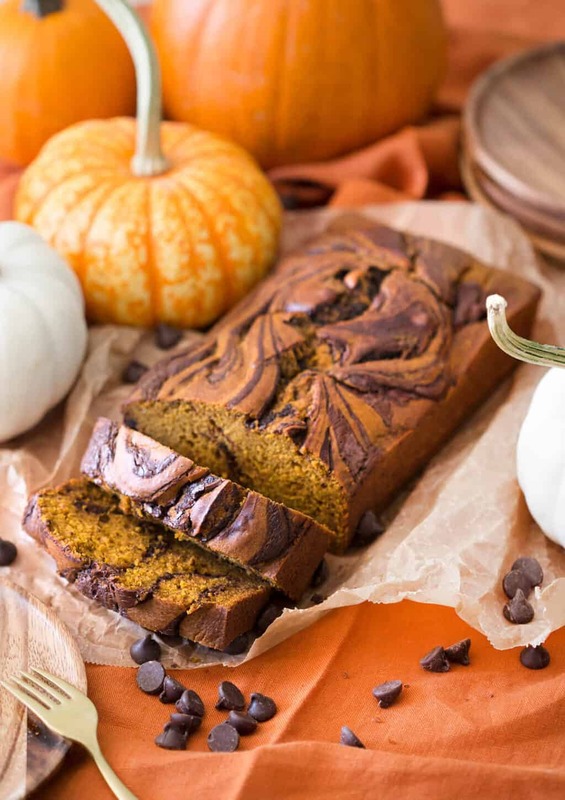 This chocolate pumpkin bread is so soft and moist with JUST the right amount of sweetness that you’ll find yourself absentmindedly nibbling on it until it’s all gone and you haven’t shared anything! If you’ve tried this “bread” out then don’t forget to rate the recipe and let me know how you got on in the comments below, I love hearing from you! 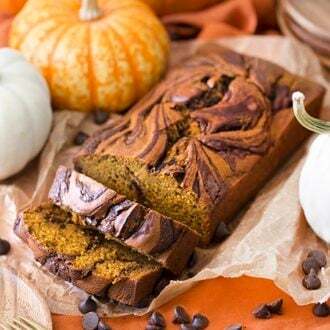 This moist and spicy pumpkin bread gets a decadent swirl of chocolate making it quite the addictive treat! Preheat to 350 degrees. Move rack to the middle. Prep a 9x5 inch loaf pan with cooking spray. Melt chocolate. Place in a piping bag. Mix in eggs, sugars and oil until well combined. 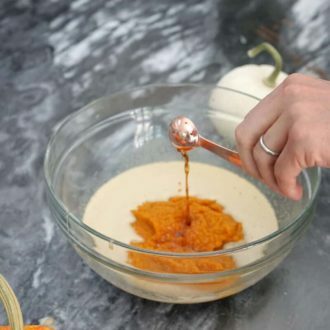 Whisk in the pumpkin puree and vanilla. Whisk again until combined. Slowly add in the dry, flour mixture. Drizzle chocolate into pan, use a spatula to swirl. Bake for about an hour at 350F. Looks good! What brand of chocolate do you recommend for this recipe? Also, if I make this on Saturday, what’s the best way to store it to ensure it will stay fresh for Thanksgiving (5 days)? I use 365 Everyday Value chocolate chips! Wrap it in plastic wrap and store in the refrigerator! Enjoy! I made this and it was so good I couldn’t even stand it! Thank you! Great recipe, but had a frustrating time making this. The recipe says to stir the dry ingredients, and then mix in the eggs, sugars, and oil. I interpreted that as stir the dry ingredients and then mix in the wet ingredients. I am an experienced baker and thought that it was odd to add the wet ingredients straight into the dry ingredients, but that was what the directions said to do. I ended up having to waste the first batch and do the whole thing over. 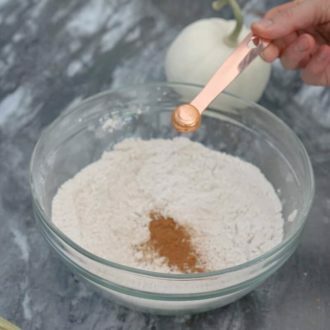 Additionally when you’re listing out ingredients, its easier to read if the list is separated into dry ingredients and wet ingredients, instead of listing some dry ingredients, wet ingredients, seasoning (which should be included with the dry ingredients), and then sugar which should be added to the wet ingredients. Also if you could write out the measurement of the chocolate in cups instead of ounces that would be helpful. Of course I can look it up online but its easier if its right there. So good and so easy! My teen daughter whipped it up for us. Looks impressive too. Thank you! totally agree. easy recipe but list is a bit misleading. I rearranged the list of ingredients to be dry then wet. Hope that helps! It was so so so moist, fluffy, not too sweet, very aromatic and pumpkin! 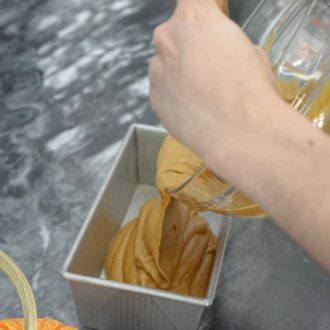 Please upload more recipe using this loaf tin! You should check out my maple walnut zucchini bread or lemon poppy seed pound cake! YUUMMM!! …. I decided to make this treat the night before Halloween so that I could bring it to my sister’s on Halloween night. BIG MISTAKE …. the entire house smelled like a yummy Fall dream. So naturally, my self-proclaimed taste tester BF convinced me that with one tiny slice he would determine if it was worth sharing. Needless to say – 1 slice turned into 2, then a 3rd for good luck … So, I had to bake a second loaf the following day and sneak it out of the house like cartel smuggling *goods* across the border. LOL … Thank you so much for this AMAZING recipe – everyone LOVED IT! It’s one recipe that I will be making again and again… cheers! It was an easy recipe to follow, aromas deliciously filled the entire house , and not overly sweet wich is a plus. After craving pumpkin something I decided to do this receipe and take the leftovers to my job and it was a hit! The chocolate ontop nicely ballanced the pumpkin Flavor and eating while sipping my pumpkin spice coffee just made it eaven better…thank you!! It’s my pleasure, i’m happy you enjoyed it. The smells that fill your home while you bake this pumpkin bread are heavenly! It makes me want to bake one every day!! Can I substitute the vegetable oil? With maybe coconut oil? Yes, you can. Just make sure the coconut oil comes to room temperature or melt it before measuring it.